What’s in the Kampong Kitchen? The Kampong Kitchen is nothing like the modern kitchen we are used to. The Kampong Kitchen had no refrigerators, modern stoves, appliances or running water. It was a rustic kitchen outfitted with extremely basic items like a cleaver, chopping block, a few pots and pans (especially a deep wok known as a kuali), a kettle for boiling water, wood stove, fire tongs and a palm leaf fan for stoking the fire. 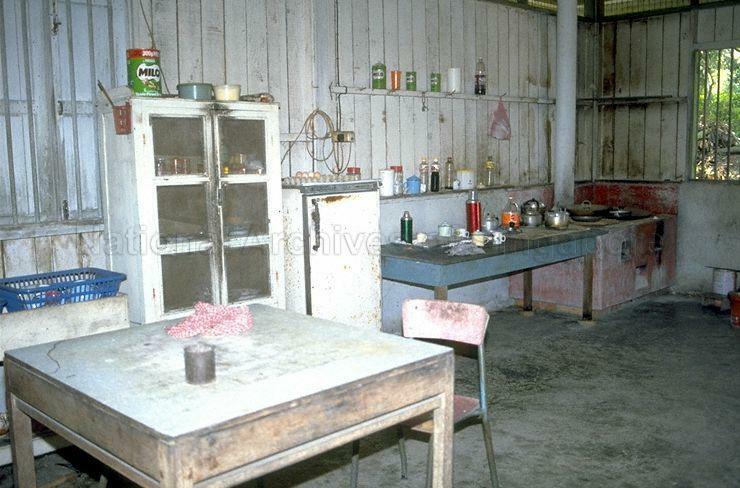 Many kampong kitchens also had a wooden cupboard lined with wire mesh. This cupboard was used for storing dishes and food, and the wire mesh prevented insects and geckos from getting to the food while also allowing for ventilation. This is an extremely important feature because in Singapore kampongs, windows are often left open for ventilation and there are no window screens to keep out bugs. This means that every kampong dwelling houses its fair share of insects and geckos and yes, even rats. 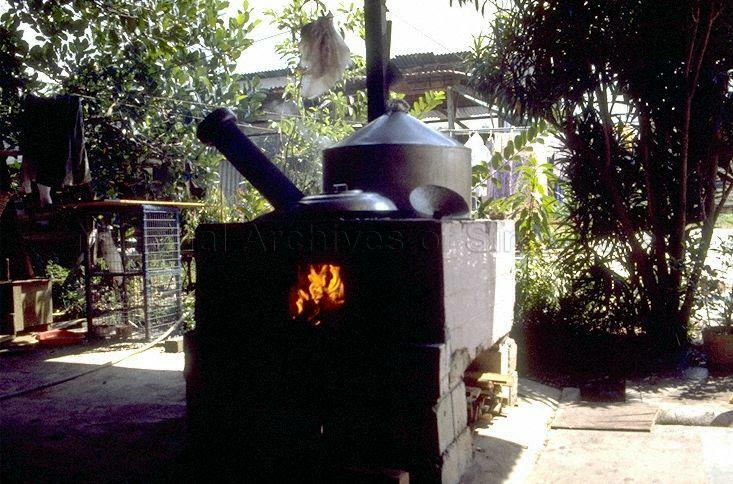 A wood stove used in a Choa Chu Kang kampong. Image courtesy of National Archives of Singapore. 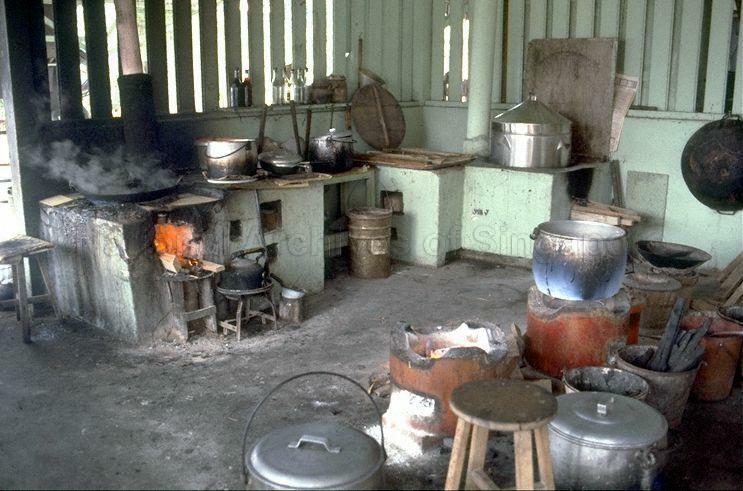 For most of Singapore’s food history, kampong kitchens had no modern gas or electric stoves. Food was cooked on wood stoves with firewood collected from the wild or purchased from sawmills. Charcoal and kerosene were sometimes used but it was less commonly used because they cost a lot more than wood. If you have ever manned a BBQ grill, then you know that cooking with fire is unpredictable and tricky, and can make cooking even more challenging. Wood fires also created a lot of smoke and indoor kampong kitchens were often hazy from poor ventilation. 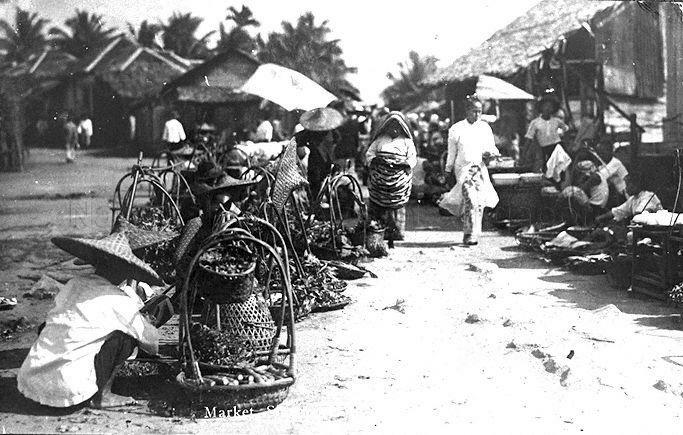 A market in early Singapore. Image courtesy of National Archives Singapore. The kampong cook did not have the luxury of a well-stocked fridge or pantry. Shopping was done once a day and people only bought what they could use up that day because there was no way to keep food fresh. The exception was for ingredients with a longer shelf life like rice, dried seafood and preserved vegetables. These shelf-stable food items allowed the kampong cook to put food on the table on days when fresh vegetables and meat were not available. Who Were the Kampong Cooks? 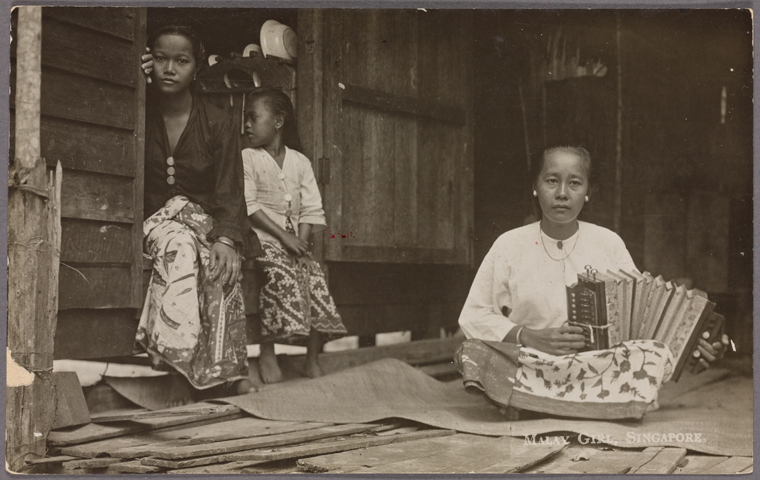 The kampong cooks were mostly busy women raising large families. They had to juggle looking after large extended families, including elderly parents, and household chores that included washing clothes by hand, raising livestock, growing vegetables, collecting firewood and more. How to Cook like a Kampong Cook? It’s hard work putting meal after meal on the table every day, a chore that kampong cooks seem to do without complain. Not to mention the washing up after that requires hauling water from the well or standpipe. And yet, the kampong cook was able to produce meal after meal of tasty food for their families. Check out our next post on How to Cook like a Kampong Cook! We’ll teach you techniques that you can use to create fresh easy meals out of any kitchen!